NAUGATUCK — Borough firefighters — those at the beginning, middle and end of their careers — were honored during a special ceremony. “It takes hard work and dedication to become a firefighter,” Naugatuck Fire Chief Ellen Murray said April 5 at the annual Employee Recognition Ceremony at the Naugatuck Event Center. Second Assistant Chief John DeBisschop, the master of ceremonies at the event, began with a badge pinning ceremony for two new firefighters, Kyle Kosiorowski, and Harley Pretty. DeBisschop said Kosiorowski became a junior member of the Shelton Volunteer Fire Department when he was 16 years old. He attended the Connecticut Fire Academy’s Recruit Firefighter Program, attaining several certifications. He is also certified as an Emergency Medical Technician. 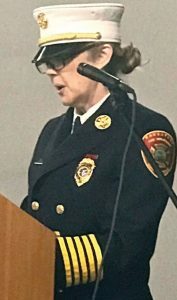 DeBisschop said Pretty is attending Connecticut Fire Academy’s Recruit Firefighter program and holds an Emergency Medical Technician certification. He is a U.S. Army veteran, having served on active duty from 2012 to 2018. During his service, he worked as a helicopter mechanic and spent his last three years of service assigned as a UH-60 medevac helicopter crew chief, DeBisschop said. Several retiring firefighters were also honored for their service, including Albert Beltrami, for 26 years of service; William Scanlon, Michael Chatfield, Richard Tavares and John Lauer for 20 years of service. The late David Porto was also honored for his retirement as a dispatcher with 20 years of service. Capt. Walter Seaman received the Commissioners Recognition for coordinating live fire training for the department in September of 2018. The Firefighter of the Year Award for 2018, which was given to Deputy Fire Marshal William Scanlon, and Firefighter of the Year Award for 2019, which was given to firefighter and mechanic Anthony Salcito. Military Service Awards were given to firefighter Nicholas Marsan and firefighter Harley Pretty. Unit Citations were given for three fires. One occurred Jan. 1, 2017, at a house on Geraldine Drive. The other blaze was on March 1, 2017, at a Maple Street furniture store. The third fire, which involved a fatality, occurred on January 26, 2018, at a residence in the Idleview Mobile Home Park. The Armand Brodeur Memorial Community Service Award was given to Lt. Jason Seamon for 2018 and firefighter and assistant mechanic Stephen Hebb for 2019. Dispatcher Joseph Del Buono, dispatcher David Hardt, and firefighter Jason Salemme were honored for five years of service. Capt. Walter Seaman was honored for 10 years of service, while Capt. Jason Alford and firefighter and assistant mechanic David Christoff were honored for 15 years of service. The late David Porto, dispatcher; Capt. Michael Chatfield; Firefighter and assistant mechanic Stephen Hebb; firefighter and mechanic Anthony Salcito; Deputy Fire Marshall William Scanlon; firefighter John Lauer; firefighter Richard Tavares and fire police Matthew Toms. Fire Marshal Robert Weaver was honored for 30 years of service.